Mumbai: The Finance Association of XLRI (FINAX) recently hosted the 9th Edition of GNOSIS 2018 – XLRI’s Annual Finance Symposium on November 17th in Mumbai. The symposium saw Dr. Rajeev Lall – Founder & CEO, IDFC Bank deliver the Key Note Address on ‘Banking and financial services in India: The expanding horizon’. He gave a rousing speech on how banks and other financial institutions can maintain a balance between social responsibility and commercial viability, by addressing all stakeholder needs. The key-note speech was followed by a panel discussion on ‘Consolidation of the Banking Industry in the wake of NPAs’ by four eminent panellists including Ms. Anshula Kant- MD, State Bank of India; Mr. Rahul Chawla- MD & Head of Structured Finance Trading and Structuring, Deutsche Bank; Mr. Sanjeev Lall- Partner, Udvik Infrastructure Advisors LLP and Mr. K. Balasubramanian, MD & Head of Corporate Banking, Citibank South Asia. The panellists conducted a very enriching discussion about the current NPA crisis, mergers and acquisitions that can enhance the capital base and suggested reforms to strengthen the banking industry and SMEs in India. This panel discussion was followed by a session with Mr. Samit Ghosh- Founder, MD & CEO of Ujjivan Small Finance Bank as the guest speaker. He spoke about his journey on how he founded Ujjivan Small Finance Bank, its current business model, the challenges he faced and Ujjivan bank’s future goals. The second panel discussion on ‘Future of Alternative Investments in India’ was participated by Mr. Shamik Moitra- Managing Partner & CEO at Maitreyi Capital Advisors; Mr. Rahul Mehta- Director & India Country Head, Argonaut Private Equity; Mr. Srinivas Baratam- MD, Kriscore Advisors and Mr. Inderjit Camotra- EVP, Centrum Financial Services Limited as panellists. The panel saw stimulating discussions about various categories of investments in India, legacy structures of alternative funds and how to hedge the risks related to them followed by a Q&A session. The panel discussion was followed by the next guest speaker Mr. Umakanta Panigrahi- MD at Duff & Phelps on the topic ‘Valuation of unconventional businesses’. The ‘GNOSIS Excellence Awards’ ceremony saw distinguished XLRI Alumni such as Mr. Sanjeev Lall and Mr. Shamik Moitra along with Mr. Sandeep Upadhyay- MD & CEO, Centrum Infrastructure Advisors Ltd.; Ms. Anita Belani- Operating Partner, Gaja Capital; Mr. VInay Razdan- CHRO, HDFC and Mr. Santosh Das Kamath- MD & CIO, FIxed Income, Franklin Templeton receive awards for their achievements in the sector. Each of them shared their experiences and memories of their time at XLRI, much to the delight of the audience. Established in 1991, The Finance Association at XLRI [FINAX] is essential to the finance domain at XLRI. 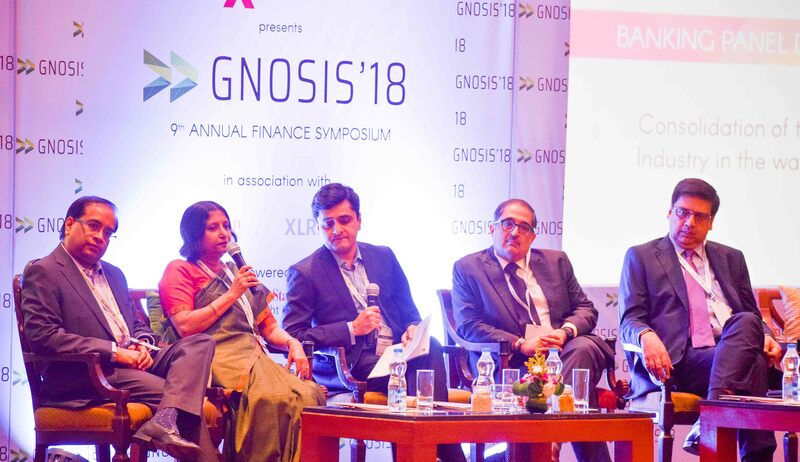 GNOSIS, which is in its 9th year, continues to get bigger and better, with a terrific speaker line up of top bankers and entrepreneurs and 150+ corporate and student delegates all over India attending the event this year. Next articleIIT Madras co-hosts the First World Technology Universities Congress to be held outside U.K.